Traveling in China can be a bit difficult as a tourist. There is a significant language barrier, the culture is quite different, and just getting into the country basically requires handing over your first born in some extreme effort to see the Great Wall. When we first started planning our trip to China, we planned on spending 8 days there before continuing on to Japan. But after finding out Chinese visas would cost us about $800 for our family of three we decided to take advantage of China’s 72 hour visa-free transit option. The bad news is we had to change our travel plans and spend just 3 days in China. The good news, we saved $800! 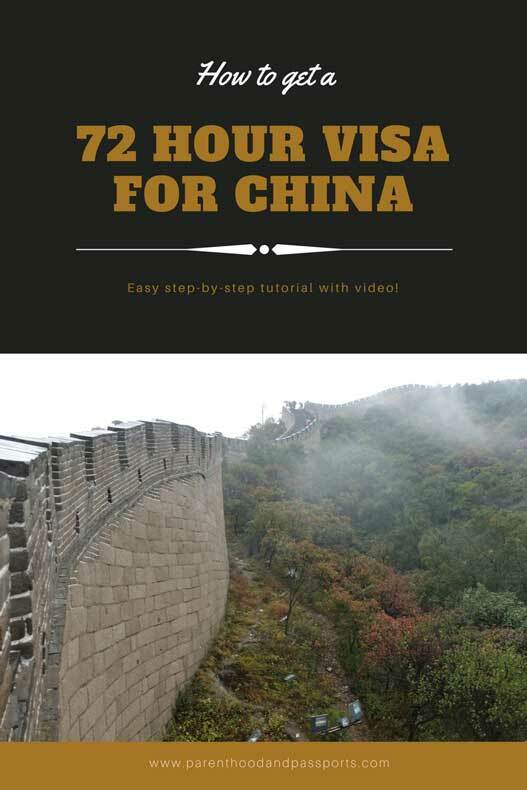 If you also plan on utilizing the 72 hour visa to China, this step-by-step guide will walk you through the entire process. What is the 72 hour visa to China? If you hold a passport from one of 51 countries, including the USA, you can enter China without obtaining a tourist visa as long as you can prove you are leaving within 72 hours. You also must be transiting through the country, meaning you must be arriving from one country and going to another. For example, we flew from the United States to Beijing, China. We then flew from Beijing to Seoul, South Korea. You would not be able to obtain a 72 hour visa to China if you were to fly from the US to China and back to the US in 72 hours unless you had a layover (regardless of length) in another country. There are a few things you must have to apply for the 72 hour visa to China. 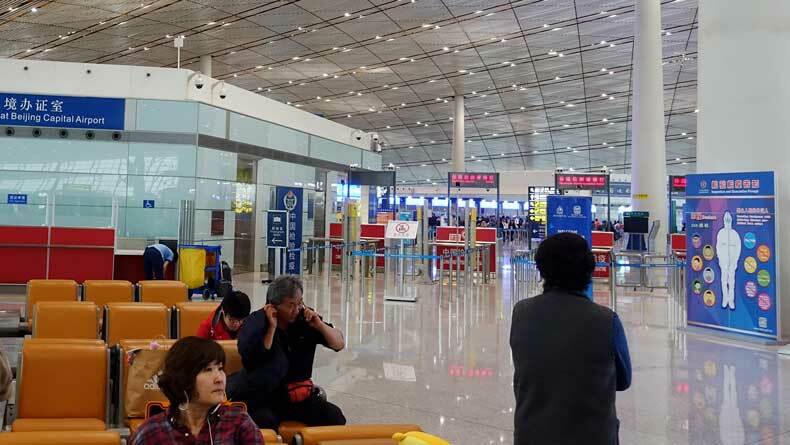 You must have your onward flight booked and a copy of your tickets leaving China in hand when you arrive at your departing airport. Three blank pages in your passport. You also must be arriving directly into the city in which you plan to use the 72 hour visa from another country. 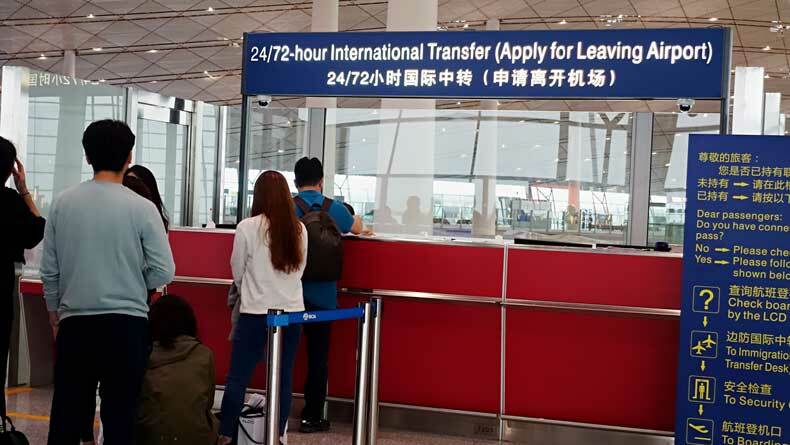 At check-in, the airline attendant will ask for your Chinese visa or your onward tickets showing you are leaving China within 72 hours along with your passport. They will ask for this again at the gate as you board your flight to China, so keep it handy. 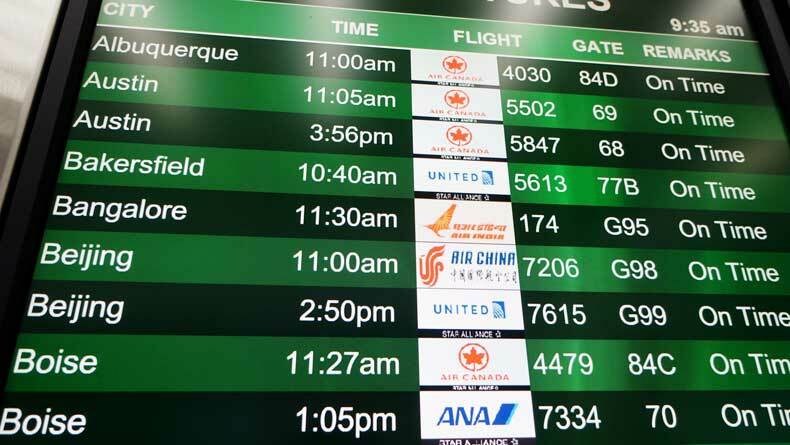 It is important to note that your flight must leave within 72 hours of your arrival… not 73, or 74… 72 max! This applies to Beijing and most other areas of China. However, if you are flying into Shanghai, Jiangsu, or Zhejiang you have a little extra time. The transit visa is actually good for 144 hours in those cities. And travel to Hong Kong does not require a visa for US passport holders or those from roughly 170 other countries. You will still have to fill out a customs form (one per person). This will be handed out on the plane. Bring a pen. (I always forget that!) Once you arrive at the airport you will NOT go straight to the customs line like the majority of passengers. Do not go through these gates into the customs area until you get your 72 hour visa to China! 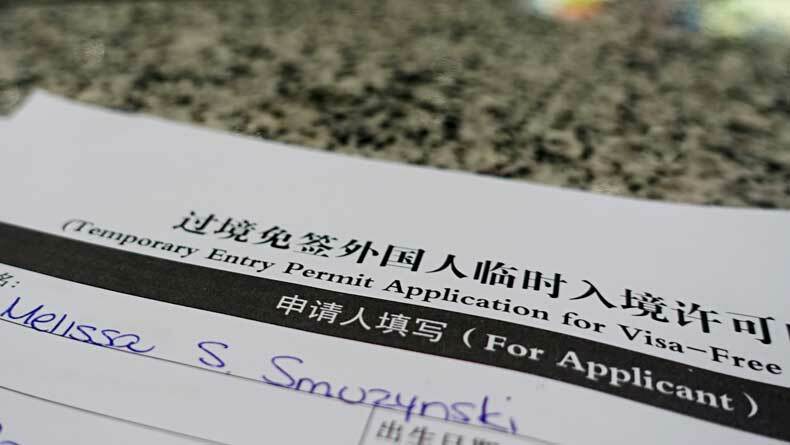 Instead, you will stop just before entering customs to apply for your temporary Chinese visa. In the Beijing airport, this line is not as obvious as it should be. When we arrived, we did not see this line and ended up standing in the customs line only to be told to exit back into the terminal and obtain a temporary visa. Don’t make the same mistake. The customs line is long and we wasted about 45 minutes. That’s no fun when traveling with an impatient toddler. Plus, when you only have 72 hours and the clock starts ticking once you land, wasting time is likely not on your itinerary. Go to this line to get your temporary visa before going through customs. Before you get in the line to apply for your temporary 72 hour visa to China, walk up to the front of the line and grab an application. It’s only a short one-page form that every person in the family (including kids) must present. You may have to interrupt the attendant and ask for one. Sometimes the forms are sitting out on the counter, but if they aren’t, you need to ask. The attendant will probably not acknowledge you unless you speak up and ask for a form. I stood there for 10 minutes trying to be polite, until finally another traveler told me I had to just interrupt. Once I did, she instantly handed me the forms and went back to work. It should be a more efficient process, but unfortunately in our experience it wasn’t. Be forewarned, this process takes forever!! We were in line for 2 hours and there were probably only 15 people in front of us when we got there. What happens at the counter? Despite the two-hour wait, once you are at the counter it doesn’t seem like it takes that long to process the visa. The attendant reviewed our applications and looked at our onward tickets and passports. She punched a few buttons on her computer, then scanned our documents a couple of times and sent us on our way with our new temporary 72 hour visa. The good news is, we were given a sticker to use a special expedited customs line that is typically reserved for diplomats. So we didn’t have to stand in the long customs lines again. Instead, we zipped through the expedited line. We handed them our customs forms, our passports, and our new 72 hour visas. The customs agent gave us a special stamp in our passports documenting our allotted time in the country, and we officially entered China! The obvious disadvantage is the short amount of time you will have in China. You must leave within three days, and there isn’t much you can see and experience in just three days. Sure, you can see the popular tourist sites… the Great Wall, the Forbidden City, the Temple of Heaven… but you won’t have time for much else. It’s hard to truly appreciate a culture in just 72 hours. For us, that unfortunately meant we only saw China in the rain, as well. It rained the entire three days we were there. Had we stayed longer we would have been able to see Beijing in sunny weather. I’m sure that would have been a much more pleasant experience. The second disadvantage is you can’t leave Beijing. But wait… the Great Wall is technically outside of Beijing isn’t it? Does that mean you can’t visit the Great Wall on a 72 hour visa? I don’t know the technical answer, but I can tell you, we visited the famous landmark without any problems. No one is stopping to check visas on the highway or at the gates to the Great Wall of China. You basically just need to be spending the night in Beijing during those 72 hours, so a day trip to see the wall is totally fine. You will save a lot of money. As I mentioned earlier, for our family of three to get tourist visas to China we were going to be out $800. Considering we were originally only planning on staying seven days in China before continuing on to Japan, that was going to be pricey. If you are considering a full tourist visa, it is less expensive if you can actually go to the Chinese Consulate and apply in person. We live 11 hours from the consulate that serves our state, so that wasn’t an option for us. So we were going to have to pay for a visa courier service to deliver the applications for us. But the 72-hour Chinese visa costs nothing! If you don’t want to fork over the extra money to get a full tourist visa, the 72 hour visa-free transit option is a good alternative. It allows you to get a small taste of a very big country. You can definitely see Beijing’s highlights in that amount of time and you’ll be able to mark one of the seven wonders of the world off your bucket list! I hope this helps make the process easier to navigate! We’ve put together a short video of our time in the Beijing (PEK) airport to show you what to look for and where to go once you land. Have you been to China? Did you visit on a 72 hour transit visa? We’d love to hear from you! Leave us a comment and let us know your experience. Didn’t know this! This is super helpful and inspiring some great trip ideas in my head. Thanks for sharing! I havent thought much about China but these are great tips – worth it to save the $800! I guess too people fly to China from the US to connect to other Asian cities, so this would be a great option to know about. Yeah for sure. We already planned on visiting two countries in Asia, so it was an easy decision for us based on the cost savings alone. As much as we would have loved to see more of China, I think we would probably want to spend at least two weeks in the country to make the visa expense worth it. Really good info to have – I had no idea! I actually re-routed a trip last year and took Shanghai out as I decided it wasn’t worth the visa hassle for a short visit. Now I know better! Great article. Our family did the same thing last year when visiting Beijing. So we assumed when we went to Shanghai this year that it would be the same. NO! They offer a 96 hour temporary visa for Shanghai, I think it is probably to allow people more time at the Disneyland park there, I wish we had known. Yeah, you really get a good deal with the Shanghai visa. We will definitely plan a stop there on our next trip to Asia. I’ve heard great things about Shanghai. I just discovered this option when embassy told me insufficient time for visa processing. Keeping my fingers crossed the 72 option works for my short trip. As long as you are in and out within 72 hours, it should work like a charm! Hope this guide helps you navigate the process. Enjoy your trip to China! Thanks! My daughter and I are stopping there on way back from Japan next week and this is awesome help!